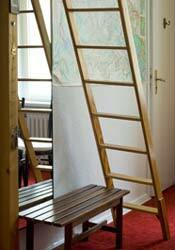 Berlin Schöneberg is a district situated not only geographically but also culturally between the trendy district Kreuzberg and the middle class Wilmersdorf. With its stylish taverns, cafés and restaurants the district becomes just as livey as the surrounding quarters. In order to experience Berlin Schöneberg, one could visit the Winterfeldtmarket, at its best on the weekend, perhaps the most well-known weekly market of Berlin. Here there are high-quality fruit and vegetable stalls as well as flowers, cheese, furniture and clothes. After which, one can experience the numerous Cafés. Cosy bright guest room with loft for two guests and an extra sofa-bed for one further guest (both 1.40 m) on the 4th floor with elevator. Television in the room. The bathroom is shared with your host. 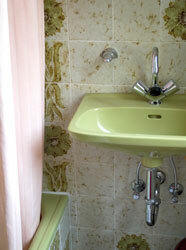 You have your own shower in your room.The guest room is a non-smokers-room! The accommodation is not suitable for mechanics. If you'd like to stay here with 4-7 guests - just ask - there are other possibilities in the neighbourhood. Your host is an "old" traveller herself and speaks English - she is happy to welcome guests from all over the world and will give you some tips for your stay in Berlin. 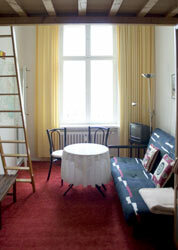 For more than 30 years, the hostess has felt completely content and safe in her Schöneberger apartment. One of the best Thai restaurants is located in the same house and there are also many restaurants and shops in the vicinity. Good travel connections in both east and west, U-Bahn (subway) on the doorstep. The biggest European shopping centre – KDW is within walking distance, and from there the “Gedächtniskirche” (Memorial church) and Ku`damm are just a short walk away. From the main train station directly to the apartment by bus M 85 to Kleistpark and 1 stop by the U-Bahn 7 (subway). Good connections by busses M85 and 100 to Potsdamer and Alexanderplatz. Yes, and thanks to the many nice visitors, you’ll be able to top up your own travel savings. For your breakfast you can use the kitchen or you go in one of the local streetcafés in this interesting district Berlin Schöneberg. You can get breakfast for 4 euros per person. Public transport is perfect. You have the underground at the front door and some bus lines also at night. There is no extra car park but you can park your car without any charge on the street. One night-only stay 3 euros more per person. Long stay? Every 7th night is free of charge. Price is per night without breakfast. 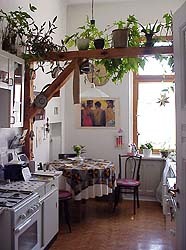 There are breakfast cafes nearby or you can use the kitchen to prepare your breakfast. To book the room you need to pay minimum 25 % in advance. The city zone (A) within the S-Bahn-Ring (city train circle) is part of the LEZ. If you do not have a sticker for the LEZ of Berlin city centre, you can find information here, on how to get LEZ stickers for tourists. 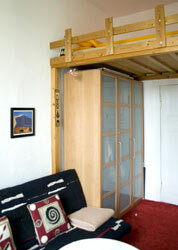 This guest room is made available by Privatzimmer Sens, Agency for holiday apartments and guest rooms in Germany.